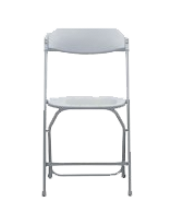 Durable and comfortable chairs for your guests. Tables and chairs are delivered to you in the front of your location (curb delivery), they are not set-up for you. When your party is over, the tables and chairs should be in the location where we dropped them off. For the set-up and take-down of tables, add an additional $1.50 per table. For chairs, add an additional $0.50 per chair.